The SpiritDrum Festival is for anyone whose heart is moved by Music. We draw upon the rich Wellsprings of Spirit and the Rhythms of Life itself. All cultures celebrate both the human condition and our connection with the divine through music, through dance and chant and song and instruments of every kind; and when we bring these arts together among the Tribes of the Wide World, sharing the many different ways we express that which is most common to us all...it's Magic! The Association for Consciousness Exploration, (the people who bring you The Starwood Festival), in collaboration with the fine folks at Musart, proudly present the first SpiritDrum Festival, a weekend devoted to World and World-Beat Music and the spiritual traditions behind it. Held Sept. 18th - 21st, it will feature concerts, drum circles, workshops and videos by several fine musicians from around the world, in a natural setting on a private campground in Western New York State. This debut event feature's a special Tribute to Master Drummer Babatunde Olatunji, the great teacher who brought African Drumming and Music into the American consciousness, to honor his passing and great contributions. 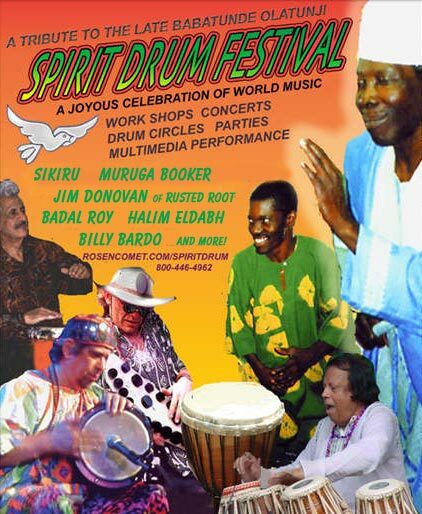 Concerts and classes feature Muruga Booker & the Global Village Ceremonial Band, Halim El-Dabh, renown tabla player Badal Roy, Sikiru of Drums of Passion, special guest Jim Donovan of Rusted Root, Ron Slabe and Pyrosonic, All Night Drumming with Jason and more! Registration will be $75 for the weekend, or you can come out on Thursday the 18th for a special DrumJam evening and join in a drumming circle with the featured musicians, and see video concerts of Babatundi Olatunji and others appearing at past Starwood Festivals, for an additional $25. Food will be sold on site throughout the event, and the pool, hot tub, and all facilities of this clothing-optional campground will be available. Vendors are welcome, check out our vendor guidelines.